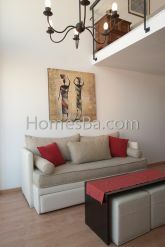 Beautiful loft in a second floor, very bright and quiet in Palermo, Palermo Hollywood, very close to the subway station. The bedroom is on the upstairs floor. 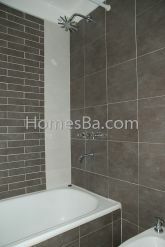 Complete and modern bathroom with bathtube. Near the entrance door there is a toilette(seen in photos). Full kitchen with utensils and dishes for 4. Breakfast table with 2 high chairs. 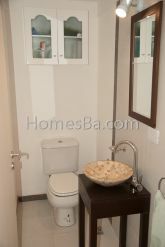 Complete kitchen with oven, fridge with freezer, microwave, toaster, electric kettle,. Tv. 21" with cable, DVD player, stereo with radio and iPod docking station, Internet Wi-Fi and ground line. Telephone. Iron and ironing table. Hair dryer. There is very comfortable sofa-bed in the living room. 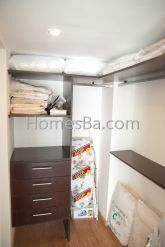 The second bed is pulled out from below and you have either 2 single beds or a double bed. Balcony with 2 chairs and table. Air conditioning of 4000 fr / cal. Central hot water. In the outdoor terrace there is a season swimming pool --very small, not for swimming, just to refresh yourself or for children-- and a nice solarium. There is also a laundry with a washing machine and dryer. Near to: Parks, Cinemas, Restaurants, Stores, Banks, Wash Stores, Bus Stop, Coffee Stores, Internet Coffee, Gyms.